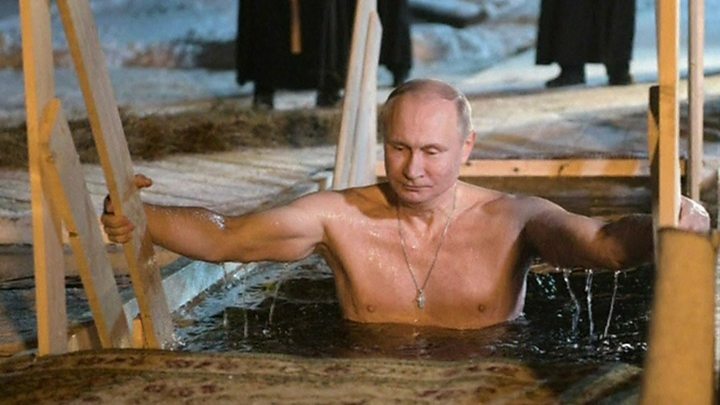 Long presented as the bare-chested, macho leader who defends Russia against the West, President Vladimir Putin now has a rather more mystical image in state media. With elections looming in March, leading state-controlled TV channels are roping in religion to cast him as a national saviour who healed Russia’s historical divisions and rescued the nation from chaos. The main vehicle is a recent documentary on top national channel Rossiya 1 about a monastery widely thought to be Mr Putin’s favourite – Valaam, on a remote archipelago in northern Lake Ladoga. Closed under Soviet rule and almost completely ruined by years of neglect, Valaam has been rebuilt since the collapse of the USSR, with – as the film implies – vital support from Mr Putin. Valaam is repeatedly described as the “mirror of Russia”. Its recovery from the ruin inflicted after the October 1917 Revolution is meant to be a metaphor for the country’s own journey under Mr Putin. “Valaam died when the great Russian state was destroyed,” the presenter says. 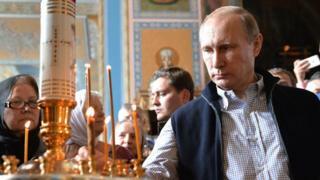 “It was restored, and our state again rose up from its knees,” he adds, over video of Mr Putin visiting the monastery. The president’s first-ever visit to the archipelago is described almost like a mythical event. “This is where a boat docked, from which Vladimir Putin emerged,” says the voice-over to rousing music. The monastery’s head, Bishop Pankraty, recounts how a holidaying pensioner there at the time “rubbed her eyes to see it wasn’t a hallucination, a mirage”, and how Mr Putin later that day promised to help restore a ruined hermitage he spotted in the woods. The message, constantly repeated, is the contrast between the monastery’s former dilapidated and vandalised state and its current splendour – a revival likened to that of Russia from the perceived chaos and national humiliation of the 1990s. Another recurring theme is that Mr Putin has led Russia back to faith since the Soviet era’s militant atheism, while also healing the rift between those who pine for the USSR’s great-power status and those who hark back to Russia’s pre-revolutionary imperial and Orthodox traditions. In the film, Mr Putin argues that the seeds of reconciliation were there even in the darkest days, because Soviet troops gave the monks time to collect the monastery’s relics before evicting them during World War Two. He then argues that communism and Christianity are essentially the same idea, and compares the mausoleum of Bolshevik revolutionary leader Vladimir Lenin to the Christian tradition of church relics. Similar themes – Mr Putin as the saviour and unity between the Soviet and pre-revolutionary traditions – were prominent in another documentary on state TV, and in even more mystical terms. Fronted by veteran ultranationalist Alexander Prokhanov, the five-episode epic was broadcast on the state rolling-news channel Rossiya 24 over Russia’s long New Year holiday. Its core argument was that the state is the sacred centre of Russian life, the subject of periodic catastrophes throughout history, before each time being rescued and revived in new glory by divine intervention. After the October Revolution destroyed the Russian Empire, the conduit for this miracle was Joseph Stalin, who created a new, glorious Red Empire, according to Prokhanov. That mythology glosses over Stalin’s gross human rights abuses. After the next perceived disaster – the collapse of the Soviet Union – the saviour was Vladimir Putin, Prokhanov argues, adding that the result is the latest Russian golden age – the “Fifth Empire”. With only two months to go until the 18 March presidential election, all this feels like part of the Kremlin’s opening salvoes in Mr Putin’s campaign to win a fourth six-year term. It is perhaps no coincidence that the Valaam documentary was made and presented by Andrei Kondrashov, a prominent journalist recently appointed as Mr Putin’s campaign spokesman. Despite protests against corruption last year and anecdotal evidence of growing discontent at falling living standards, the narrative of a glorious national revival still appears to be working with many Russians, with official polls putting Mr Putin’s support at around 80%. But the Kremlin still seems to be nervous. The man widely seen as Mr Putin’s most potent challenger, protest leader and anti-corruption campaigner Alexei Navalny, has been barred from standing, over a criminal conviction that many see as a political manoeuvre.